Daily life was always quite chaotic. We knew, that Lotta wanted to eat and that she would learn it, but we couldn’t find the right way to support her learning. We were constantly searching for a solution… G tube? New speech and language therapist? Are we capable of going all the way to Graz? Due to the nasogastric tube, Lotta had great problems in swallowing her saliva. Therefore, breathing was difficult. She hated her tube and pulled it out frequently. So we had to watch her closely, always having a new tube and supplies ready, begging doctors and health insurance for their help. Constant weighing, how long can the tube stay out? How much food can she tolerate? Sometimes we had to put in the tube a few times a day, besides that, we offered puree. Sometimes we couldn’t leave the house for days as breathing was so hard for Lotta because of the tube. Our whole daily life was dominated by the tube. Oh, there were so many wonderful moments. When we came to Graz, we had already completed a few months of Netcoaching. The close exchange was encouraging for us, although Lotta did not make the progress we wished for. So, after careful evaluation, we went to Graz. When we arrived, Lotta was not considered as an “all will go well”-candidate, it was uncertain if she would be able to eat and drink after the two weeks. But as soon as we got there, after talking to the therapists and doctors, they could see Lotta and we felt in good hands. I could just get rid of my worries and care for Lotta. There was a positive atmosphere – no reproaches, no fuelling of unjustified fears, no “we don’t know if this will work” as we knew it from home. So much appreciation and real devotion. And encouragement. One could burst out crying or start giggling, someone always took part. The contact to the other families also made us feel good. Lotta is very happy since she got rid off her feeding tube. Sie is much more confident and calm. Now, we can go out. We can visit dad at work, friends, hang out with other kids, dance together while she is in the baby sling, go to the café, drive with a car or bicycling,…enjoy the beautiful little things in life. … and on street, there are no pitiful smiles anymore. It sounds trivial, but it is a huge relief. Our wedding.It already was really exciting and a special day, but when we sat at our wedding table and fed Lotta orally and did not need to tube feed her anymore, all our relatives and friends were totally happy. 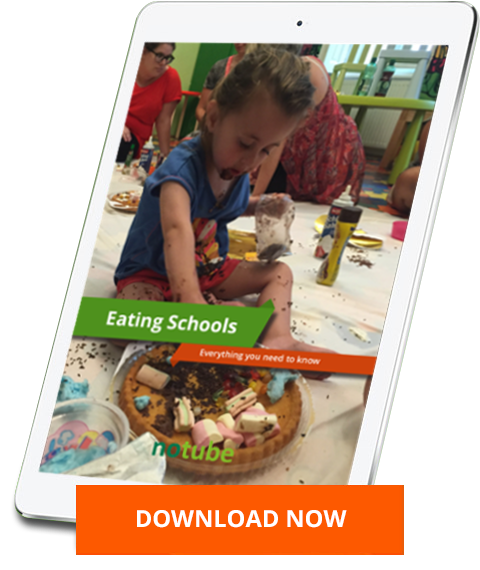 We’ve helped over 3,000 children learn to eat without their feeding tubes.